ERCOLINA offers a range of precision machinery for bending tube stock. From simple tube benders to complex CNC mandrel benders, ERCOLINA is known for high-quality fabrication equipment that delivers precision bends each and every time. Read on to learn more about their various product lines, and contact us today to ask a question or request a quote. These simple tube and pipe bending machines process 1-1/4″ to 6″ pipe. And with one-touch control as well as the ability to store multiple bends and programs, SuperBender and TopBender machines are a favorite of fabricators worldwide. If your shop bends large radiuses, create spirals or rolls pipe into a ring ERCOLINA’s pyramid roller is the right machine. Supporting a multitude of small to large diameter tube and pipe sizes as well as extruded profiles, this bending machine is programmable and can be set up to bend in both horizontal and vertical positions. 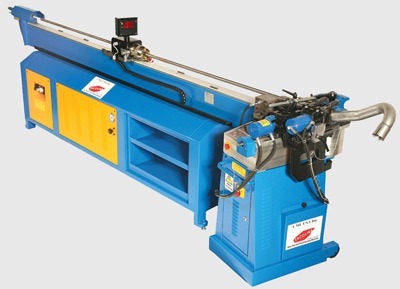 ERCOLINA’s line of NC semi-automatic mandrel bending machines are an investment in your business that will provide years of high-quality profile and pipe bending. Innovative bending head design and highly-accurate NC control give these machines the ability to eliminate welds, elbows, and seams with quality bends. Even better, ERCOLINA’s CNC mandrel benders represent the state of the art in pipe and tubing benders. These machines feature sturdy steel construction and precise computer controls that create quality bends every time, even when your bending application requires complex or tight-radius bends. If you’re interested in learning more about tube bending machines from ERCOLINA, contact us today.